“Relax with Reiki”, group class on Friday nights. I previously explained Reiki in more practical terms last month in my “What is Reiki?” post. If you haven’t read it, check it out here. So what’s Group Reiki? Basically, in my Group Reiki classes, which usually accommodates 6-12 people (depending on the location and duration) we start with a grounding meditation, set a clear intention to direct each person’s healing (a.k.a goal) and then I facilitate mini Reiki treatments on individuals to give each person a short energy clearing and a boost leaving you revitalized and potentially more inspired than before you came to class. Because it’s in a group setting, there isn’t much time to individually analyze why you’re experiencing imbalances at the current time and what’s driving it (which is typically done in a private session). However, if someone has been doing other types holistic healing consultations, they may very well know what’s going on and can mention it so that I can concentrate their mini-Reiki treatment in the respective areas. In Reiki, we can also energetically verify whether that analysis is still relevant to you or not, or if something else compliments it. Meanwhile, a private 60-90 minute Reiki Energy Healing Session focused solely on you. It allow us to first do a diagnosis of any stresses, pains and blockages in your body. It gives us an opportunity to go a lot deeper into the healing process and address any physical, mental, emotional or spiritual issues and heal them at roots. It creates space for us to explore any memories and heal any past traumas stored in our body. Often physical pain is our body’s last resort to cry for help and attention. So though a backache may just be a backache, a prolonged backache usually means that there’s something more there to be addressed. In general, Group Reiki allows us to address any immediate or surface issues, which is great for busy bees who want to pop into class during lunch, between meetings and after work to destress i.e. if your boss isn’t being nice to you, your colleagues are busy playing politics at work, it’s a great way to clear all that negative ju-ju off you so you don’t carry it home. It’s perfect for energetic maintenance, a “tune-up” if you will. And it’s a fantastic way for people new to Reiki to get a taste of it with a small commitment. And side note, a Reiki class is very different from Reiki training (at least in my book). A Reiki class is for a group of people who want to receive Reiki treatments. Reiki training is reserved for those who are interested in learning the practice and potentially becoming practitioners, or even a Reiki teacher one day. It’s COST EFFECTIVE - It allows people to try out Reiki at a small cost. It’s a CONSCIOUS PRACTICE - It’s a great alternative to yoga and meditation. Reiki works on an energetic level so you may become inspired to explore consciousness from a different angle. COMMUNITY - We have a nice little Reiki community. What started as a few attendees has now grown into the hundreds. I love seeing participants connect with each other, and grabbing a bite to eat after class. 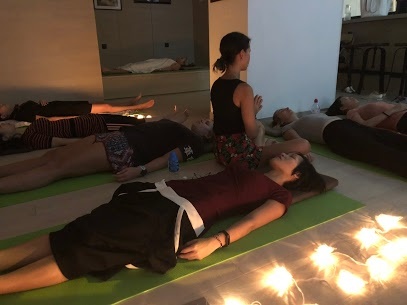 MAINTENANCE - It allows private Reiki clients and regular class participants who work/live in Central and Sheung Wan to jump in and get their Reiki fix during lunch or after work to upkeep their energetic balance before they have a proper healing session. WORK/LIFE BALANCE - in partnership with Naked Hub Co-Working Spaces (now owned by WeWork), which combined is the largest co-working space in the world, my Group Reiki classes have been a part of their Weekly Wellness Program for almost a year. Group Reiki has been helping busy entrepreneurs and their colleagues get a mental break, a dose of balance, restoration and relaxation before pulling another late night. BONUS REASON: VARIATION - I’ve trained a small group of Reiki practitioners over the year who always love sharing Reiki with others so they can develop their practice. Allowing practitioners to connect with participants is a lovely way for them to grow. And equally, a wonderful way for participants to try out Reiki from different practitioners so they could get a better idea of what type of energy/who they currently resonate most with. If you’re going to the IRIS: Your Escape, the largest outdoor wellness festival in the city this weekend (September 22-23, 2018) I will be offering a “Relax with Reiki & Meditation” class on Saturday, September 22, 2018 from 17:20-18:20 at the Zen Garden. The class is inclusive of your day or weekend pass to the festival. Tip: Get your tickets 20% off by entering my promo code “CorieChu20”. If you’re unable to join us at IRIS but would still love to try out a Group Reiki class, check out my upcoming classes below. See my FULL CALENDAR HERE for more information and to sign up! For any questions, always feel free to CONNECT WITH ME. I hope this inspires you to check out a Group Reiki class and get your weekly Reiki fix on! And if you’re ready to jump into a 1-on-1 Private Reiki Energy Healing session, click HERE. I offer Reiki services in Hong Kong.